To join, check out Julia’s Place and ‘What is 100WCGU?‘ This week’s prompt: when the night demons visit. A wispy-haired woman stabbed wood into the yawning woodstove. Jason read at the kitchen table. The autumn wind rattled the windows and shook the dilapidated farmhouse. He paused and cleared his throat, licked his forefinger, and turned the page. The kerosene flame flickered and hurled giant silhouettes around them. “You can’t hide when the night demons visit.” He leaned closer to the meagre light. Eyes bulging, Jason shook his head. Categories: demons, figures, fire, return, spirits, wanderers | Tags: nightmare, reading cramming | Permalink. 😀 Thank you, kind sir. Ha ha. Thanks Gilly. I’m too skittish to work with snakes like you. No idea how this was going to end. Those demons have incredible timing! Well done Tess! Ha! 🙂 Though you didn’t say that….now that I think about the story…I do believe I felt that. Snoopy would be proud of you! Too creepy! Well done, judging from the goosebumps on my arms, Tess! Goosebumps? I’ve never produced those before. Great descriptive scenes. One of the Poe lovers! Oh, spit Tess. Dang, you set this one up! I hope that’s a good thing but what does it mean, Val? It is absolutely a great thing! Duh. I wasn’t fishing. I didn’t understand. Thank you. Tess, I’m tempted to put you in touch with the ‘Burmese Rebels’ that frequent the space under Gill’s bed and ‘attacher during the night! Well done! 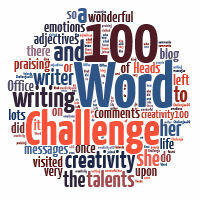 You packed a lot into 100 words. Tess – That’s really a scary thought to think your story took a turn out of your control. Yikes. Now I want to hide under the bed. Noooo. Never under the bed. Don’t do it. Love your new Avitar. I’ve been trying to get a new picture to put up but haven’t gotten one I like yet. The stress is showing on my face and gravity has really taken over. I’ve lost 116 pounds over the last 4 years. Actually the weight came off over 2 years and the other 40 pounds are just hanging around. Every new picture I see of myself looks (to me) like a drunk bag lady. These are interesting. I read one on one of the blogs I follow, that brought me to tears….passing along memories and family. very touching. I’m now more than a little concerned that perhaps my door is not locked either. Will work on summoning the courage to check as soon as the hairs on my neck lie back down! A very creepy submission, and a marvelous read. I’m tickled the hairs on your neck stood at attention. Thank you for reading and for your kind words. Yikes! A horror story. Definitely got my attention Tess. I think the sign of a dang good 100-word story is the desire to read more after it is over. Amazing. Was this inspired by China? I didn’t know you did horror. Ha ha. No China isn’t on my mind. I don’t do horror but this tickled my naughty bone once I got into it. Glad you call this horror. Thank you, Jacqui. Thanks, Debby. They were outside. I can’t believe your talent. Saying so much in so little. Amazing! I wonder why we find demons more scary at night. If they’re real, shouldn’t they be just as creepy in daylight? Is it because we try to sleep, so have time to worry? Or is it just that we’re generally more easily scared at night? Fear of the darkness? What an interesting question. It’s never occurred to me why night and day should make a difference. Hmm. I wonder if darkness is more scary because of its inky ability to hide things in nooks and crannies. What if the power goes out? We are lost and fear grabs on and chokes us. Maybe demons are more scary at night especially when we are a.l.o.n.e. Boo. Does daylight make us feel more in control? More sure of ourselves? More confident to overcome? Sure we still can be paralyzed by it but at least we have a clear view of the nooks and crannies? Are there more people around in day time?’m less afraid to check under the bed in daylight. Why is that? I cannot imagine. I think both the hiding and the control play a role. We are used to getting most of our information visually, and being “in the dark” is scary. Probably we do feel less capable of protecting ourselves. Of course agains supernatural beings that isn’t really an option anyway, is it? Sometimes I’m glad I simply do not believe in them.